These quick and easy breakfast ideas are just a few of the foods that we serve our son for breakfast. Mostly, he likes cereal but we do like to mix it up as much as possible and give lots of variety when we can. We usually offer fruit at breakfast time too and if we every forget Harry has started asking for it now! This is what Harry has for breakfast most days as it is quick, easy and he loves it! Nothing exciting to add about this one! Harry has always liked eggs and at the weekend we often have scrambled egg on toast as a family. These are so quick and easy to make! Harry loves them as a ‘treat’! When Harry is feeling poorly and hasn’t got much of an appetite he loves yoghurt and berries as a light breakfast. These can be made really quickly in the microwave and are the perfect way to give porridge to a baby when you are doing baby led weaning. A variation on porridge fingers, these fun cups can be filled with yoghurt and fruit for a healthy breakfast! I love eggy bread! Simply beat the egg and add milk if you want to, dip a piece of bread in the egg mix so it soaks up the egg mix and is well covered on both sides, then cook with a bit of cooking spray in a frying pan! Delicious! As simple as it sounds, make some toast and mash a banana on top! The same as above but with an avocado! I like this for lunch too. Quick, easy and full of healthy goodness to give your little one all of the energy they need to cause mischief all morning! These are great if you have leftover sweet potato mash from the night before! They can be made in bulk and frozen so are perfect if you fancy a spot of batch cooking. Who doesn’t love a cheeky muffin for breakfast? These are really tasty as a breakfast treat or a tasty snack. 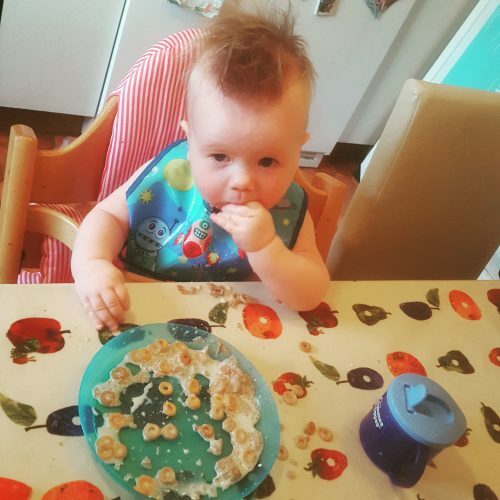 What does your little foodie like to eat for breakfast? Please share your breakfast ideas in the comments!